Outside RTÉ Studios in Donnybrook, Dublin 4. 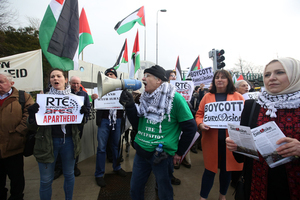 Members of the Ireland Palestine Solidarity Campaign, and their supports, protest against Israel hosting this year’s Eurovision Song Contest and call for RTE to boycott the event. 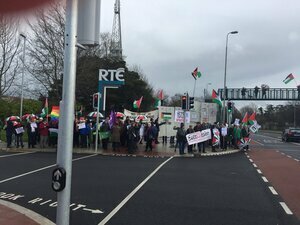 The head of the Irish Eurovision Delegation, RTÉ’s Michael Kealey responded to calls for a boycott and to the protest currently taking place outside RTÉ studios. 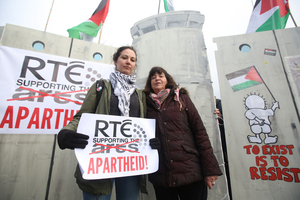 He told journalist Áine Lawlor that RTÉ is a public service broadcaster and doesn’t “take political stands”. He said taking political stands is “not something we do”, before adding that the Eurovision is about music and not politics. There May Be Fraternité Best. Sign. Ever. Hate/Haters Gonna, Etc Down Low? 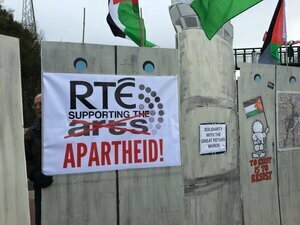 Posted in Misc and tagged Eurovision, protest, RTE at 1:51 pm on March 8, 2019 by Bodger. Yep, it’ always been about politics. They just don’t like when it’s explicit. That “to exist is to resist” graffiti is weird. 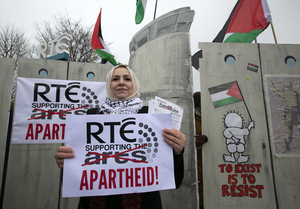 Flatus in a hurricane, if you want to stop Eurovision in Israel, put pressure on loss-making RTE to suspend its very expensive membership of the “European” Broadcasting Union, the secretive Swiss-based organisation run by ex-RTE boyo which doesn’t publish audited financial accounts. That’s what qualifies as a large crowd? “political stands is ‘not something we do’ ” – except of course when their CEO Dee Forbes actively lobbies the govt for an increase in the license fee and more public funds. The finger in the corner of the top pic is infuriating. Oh well, it was there earlier. Either that or I’ve lost the plot/eyesight completely. Yeah look at the all Eurovision itself then! I just noticed that Israel is not in Europe…problem solved. You can go to Israel on Erasmus: I only found that out yesterday. There certainly is an unusual relationship between Israel and the EU. Where is there not an unusual relationship when you include Israel? 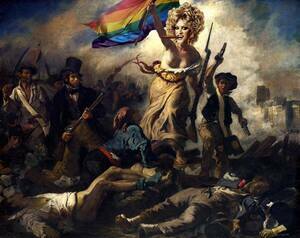 Is that a LGBT flag I see in one of the pics? Good luck flying that with your Islamist friends. Down with Jews- sorry – Zionists ! I wonder is the same kind of thing that’s going on in the UK labour party going here? 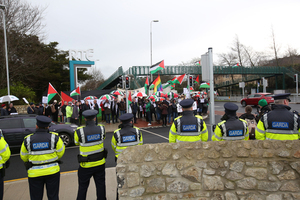 The ould Socialist – Palestinian link. Some of them support Hamas I’d say. Would you? I assume you can support that statement with some links. I’d say most of the Irish supporters of the Palestinian cause have no clue what they are supporting. FGM, persecution of homosexuals, diverting aid funds away from essential services, using the population as human shields, denying education to its children. Never mind that the STATED aim of Hamas is the destruction of Israel and the elimination of the Jewish people. That’s what they are supporting. +1 f lawless as always. Thats a lot of assumptions you’re making there mel, what are your thoughts on the racist right wing government of Israel and the oppression they are visiting upon the Palestian people every day?